In Sega's great line-up of Virtua games - Virtua Racing, Virtua Fighter, Virtua Cop, there's one that's got away... Virtua Hamster. Yes, friends, this is no joke. Designed by Eric Quakenbush, production had started and the game was to be released in 1995 on Sega's short-lived 32X. Sega wanted a new puzzle game, but something that would be different than Tetris. The plan: Virtua Hamster. As the story goes, players would take control as Chip, one of six rocket-powered critters on skateboards, and race through the hamster tubes, firing missiles and corn kernels at opponents. The goal is to find the robot Skuttle, who'll free Chip from the maze. Of course, not every animal wants Chip to get out, meaning the maze isn't the only challenge. Game development continued until Sega decided they were no longer interested in the game. As the 32X came to and end, a British company picked up the game's development and planned to release it on the PC. It never happened. Would this be the game that saved the 32X? I doubt it. My guess is that it would've fallen into the "crapware" side of the spectrum, but at this point, it's mere speculation. Could it have been the greatest game of all time? Maybe, but I wouldn't have put any money on it. I also seriously doubt that it would've been released with the "Virtua" name. SEGA's AM2 would want their hands to touch anything with "Virtua" in the title. Back in '96, the Saturn was begging for a real Sonic game - one that would be able to right the course for the sinking ship. 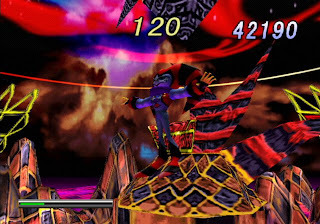 It never happened and instead, Sonic Team introduced NiGHTS into Dreams, a game featuring an androgynous, purple jester as its main character. As a Saturn exclusive, the game would never find mainstream success, but it earned good reviews and developed a cult (and somewhat scary) following. 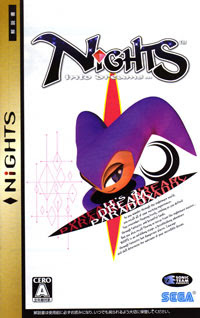 Over time, its mystique grew and Nights has, correctly or not, been hailed as one of the top all-time games. Now, after the release of its sequel, Journey of Dreams, Nights finds itself on the PS2 alongside other Saturn exclusives. It, however, eschews the Sega Ages tag and bargain price, mostly because the game is on a DVD and Sega certainly knew they'd be able to demand a higher price for this title. The story centers around two kids, Claris and Elliot, getting caught up in their own fears, which are so average it's almost comical. Claris is afraid of her singing auditions and Elliot was beat in a basketball game by some older kids. Feeling like failures, they head to sleep that night, where the dream-creature Nights needs their help. The evil Wizeman is trying to take over the land of Nightopia. If this happens, then there's no more dreams and all of the happy-go-lucky Nightopians will die. Coincidentally enough, this is the kids' chances to redeem themselves. The game plays the exact same way as it did on the Saturn. Find Nights, track down 20 blue spheres and drop them off at the capture. Race around during bonus time and try to rack up the score before the clock runs out. Do that another three times and then head off to beat up a boss. The trick to getting high scores is linking everything together. Grabbing several items in succession will pop up a link counter on the screen. The higher the number, the more points that are rewarded. By keeping the speed high and learning the ins and outs of the level, paths can be created with near infinite links available. It's being able to master these paths that gives Nights its replayability. The dual shock does just as well as the Saturn's analog pad, and after a moment of adjusting, controls just fine. First-time players that have for years been hearing how amazing and legendary the game is will probably be let down. Ultimately, Nights is just a time/score attack game. That's not to say that it isn't a score attack game done with a lot of style, though. Nights takes the Blue Sky approach to its artistic design. Colors are bright, music is happy, and everything seems cheery in the world of Nightopia. It's definitely a throwback to the old school gaming days, before there was such a huge focus on realistic and gritty game worlds. It's this feel-good world that has earned Nights its cult following - Nightopia is a pretty happy place. As the player takes out baddies, bald-headed Pians bounce around in the background, singing, fishing, dancing, and of course, making more Pians, while the music becoming ever-more cheerful. If the player decides to destroy of all these buggers, the music gets a little less cheery and the Pians get angrier in response. As the player can influence their environment, the end result is that the world just seems that much more alive. For the most part, Nights comes over as the same game, with a few new modes to justify the price. The graphics have been redone in the "Brand New Dream" mode. With crisper looking visuals, reduced pop-in, and redrawn 3D geometry (the formerly sprite-based Pians and Nightmaren are now in 3D and objects have been remodeled to remove their blockiness), the game's bright and colorful worlds really get a chance to shine. For the nostalgic, the "Sega Saturn Dream" is available that will give the game its original pixilated look. 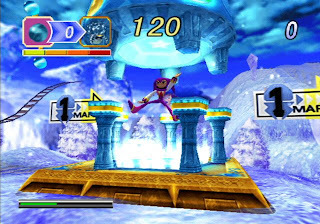 Other new PS2 additions include a move gallery for watching all of the unlocked cut scenes in the game, an image gallery featuring CG renders of characters and promotional items, and a Nightopian viewer, which will let characters check out the happiness of each level's inhabitants. Christmas/Winter Nights is included as well, and is actually a fairly big reason I wanted to get the remake. Back in '96, I had a subscription to both Ultra GamePlayers and Next Generation. Wonderfully enough, I managed to not get a single Nights demo desk from either, and I've been left out to this day. While I'm glad Christmas Nights is included, the presents feature has been taken out. 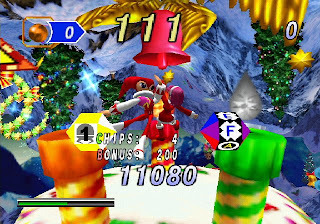 Some of the presents are already in the game, but others, like the karaoke mode and Sonic into Dreams are gone entirely. Though it's not a deal killer, it would have been nice to have everything in there. With all the good comes some bad. The PS2 seems to take a little bit longer to load than the Saturn. Another annoying addition is the lack of auto-save. While the game will still ask you to select a file when loading it up, it won't save to that file automatically like the Saturn version did. Lastly, the two-player option has been removed. In the Saturn, after defeating Reala, a two-player Nights vs. Reala game become available, but it's nowhere to be found in the PS2 version. For the dedicated, a Nightopia Dream Pack version can be purchases than includes a Japanese art book. For collectors, it may be nice, but for everyone else, it's completely skippable. Final verdict: While the graphics keep the game looking modern, it's still the same Nights. 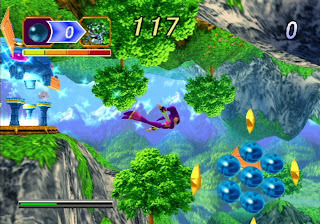 Fortunately, the game mechanics hold up after all these years, and while it's not the "mind-blowing" experience that legend has made it out to be, Nights into Dreams on the PS2 is an uplifting game that's still fun to play. It's really scary how much people want to believe in Sega. Just a few days ago, SegaNerds reported that Dreamcast.com was updated and giving away e-mail addresses to folks who sent in their Dreamcast registration numbers. Sounds fishy, I know, but surprisingly, a lot of people went for it - hook line and sinker. While it's probably just someone trying to stir the Sega folks up or at worst, about to unleash even more spam to the world, I'm a bit shocked at how many people were willing to ignore rational thought in the hope that Sega would be somehow reviving or trying to revive their dead console. To this day, people claim the Dreamcast is not dead. I still have my Dreamcast and I've enjoyed it, but one Japanese homebrew shooter every couple of months does not a "living" console make. A few months, Sega renewed their trademark for the word "Dreamcast" and people were getting really excited. Does this mean there's a Dreamcast 2? Is Sega planning another console? The Dreamcast is coming back? Sorry, but the answer has always been, "No." They just want to keep ownership of words they've spent a lot of money on, so that some other company can't call something a Dreamcast and gain instant recognition. Even longer ago, Shenmue.com had something similar happen as to what did to Dreamcast.com. It turned out it was a fan that had copied the original Shenmue site, purchased the domain before Sega could, and brought the Passport back online. Is this necessarily a bad thing? I guess not, but people tripped out until, once again, they realized it was just another anonymous person, not Sega, that was behind it all. What have we learned? Sega fans are borderline delusional? Probably, but I'll stick with this: If it's too good to be true, it is.